Industry Trust research suggests that 16-34 year-old males that see any of the "Moments Worth Paying For" trailers are then "twice as likely to pay for content." Liz Bales, director general at Industry Trust for IP Awareness added: "With each trailer execution delivering more traction and success for the campaign, it's key that this momentum continues. We're delighted to have partnered for the first time with Sony Pictures Releasing U.K. on one of the tent pole releases for 2014." 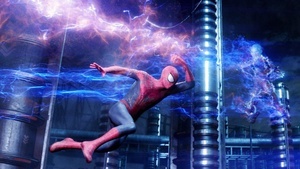 The movie's director, Marc Webb, also added: "The 'Moments Worth Paying For' campaign -- which we're very happy to be partnering with -- is a fantastic way that we can enlighten film lovers, by helping them to experience the levels of work and creativity that go into bringing them the movies they love." <Sony PlayStation 4 finally available in home country of Japan >Amazon's Android-based set-top coming next month? Completely agree seeing those anti piracy adds makes me think twice, oh wait! i don't see those titles i usually set the ripper to remove the junk,however if i did see them i would honestly think twice,yeah right ! & another pink cow just flew by. i've seen the standard ad (you wouldn't steal a car,you wouldn't steal a handbag so don't steal a movie) but i still havn't figured out how to download a car and drive it in my own home or how to download a handbag full of money in the comfort of my own home. I honestly don't think the ad will do anything and we will probably all see it soon anyway when watching live tv online or a background ad on a website.Would be nice if we could fast forward the ad. Well one thing's for sure: With this news, I'm now twice as unlikely to pay for this movie. Don't need no ad to stop me from downloading Amazing Spider Man 2. First one sucked so I won't be bothering with the second. Might as well tell them to abstain from doing the naughty thing. They sell that bs so the movie companies will fund them... doesn't matter if it's true or not. When I was sixteen, these ads only spurred me to download more than I otherwise would have. "You wouldn't steal a car..." exponentially increased my bittorrent usage. I'm right there with you. If only I'd pirated it, I'd have one less regret. I thinks it's a good idea. Maybe it'll temper down the rampant piraters that leech off society in a brutal way. I mean I d/l flicks too but I also buy a sh*tstorm of blu-rays too. Anyone that disses this is a greedy, selfish pig. It's cute how you think that's exceptional. the problem i have with ads is we are forced to watch them.There is no legal way to get dvds or blu rays without the ads.some warnings and ads cant even be skipped. imagine if a take away said no you cant have chips without salt, or a resturaunt said no you cant have salad without dressing (if you dont like salad dressing). maybe someone should start a public poll like would you be more likey to buy a movie without ads with answer yes,no & it doesn't matter.Maybe trust should set up an online poll to see what people want instead of assuming. ...maybe someone should start a public poll like would you be more likely to buy a movie without ads. ...Maybe trust should set up an online poll to see what people want instead of assuming. Corporations don't poll; they only assume for more greedy profits. Main Movie Only DVD's will be more popular for people to buy 'cos we all know that the Video-Quality could be superior on a regular double layer DVD's or BR-Dics using all that wasted space; by just dumping all the extra garbage all together once and for all. oh. & FYI: $5 DVD and $8 BR will "kill all" piracy. LOL!!!!! Hey hearme0, ddp just stuck it up your gei gei with that one. Help with development of BD RB: Donations at: http://www.jdobbs.com/.